1. WHAT IS A PLOTTING CUTTER? Quite simply, a plotting cutter is a machine that plots lines, unlike a printer, whose job is to cover an entire surface with ink. As such, cutters are typically used to print sewing patterns or technical drawings in engineering and architecture. A cutter works with a head that moves on the material; a head that will dispense ink, but which can also be equipped with a blade in order to cut the chosen material. 2. WHAT PROJECTS CAN BE MADE WITH A PLOTTING CUTTER? As explained above, a cutter enables you to draw, but its strength lies above all in allowing you to cut out lines, shapes and complex designs very easily and cleanly. 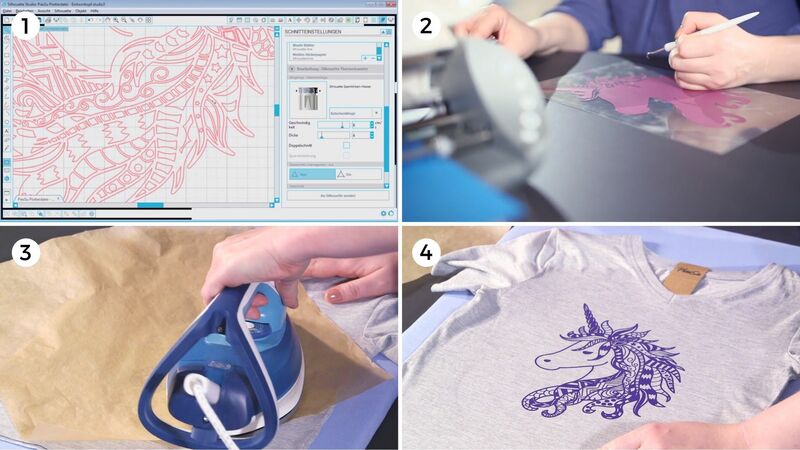 You can for example make prints on t-shirts and textiles in general, make stickers, stencils, shapes on paper (perfect for scrap-booking fans! ), and you can even cut out fabric. A plotting cutter (image 1). We recommend the SILHOUETTE Portait, an affordable and very compact cutter (41,3 x 14,2 x 11,4 cm), but depending on your needs there are also many other great brands and models out there. The cutting software, provided with your machine. A cutting file. Just as a printer will print files in specific formats - for example files with .doc, .pdf, or .png or .jpeg images - cutters are likewise compatible with specific cutting files, The formats can be: .svg, .dxf. 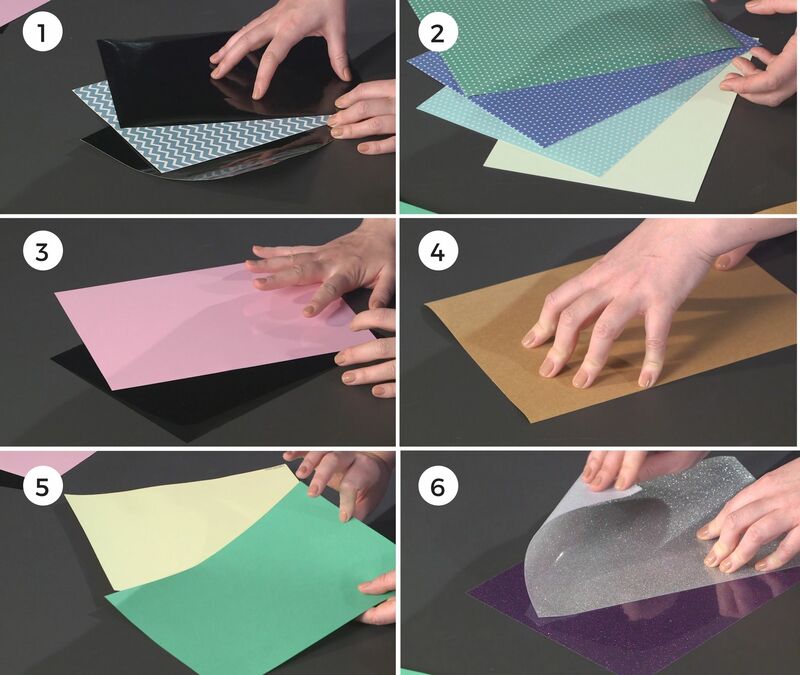 Cutting sheets : vinyl, paper, flex or flock, depending on your project (image 4)! With your cutter, you'll be able to cut out many materials, each one having its own specificity, of which its use is reserved for certain projects. 1) Vinyl. Vinyl will be used to make stickers. You can choose it for outdoor or indoor use (because, depending on the quality, it will withstand the weather better and will retain its colour) with a matt or gloss finish. The stickers can then be glued onto paper, windows or even the car body. You'll need transfer film to place the stickers onto their final material. Its adhesive power is more than strong enough by itself, and feel free to make use of a plastic card or credit card in order to avoid bubbles! 2) Flock. Flock sheets are specially designed for textile printing. Once cut by the cutter, the shape is ironed onto the t-shirt to make it stick. The flock's standout characteristic is its velvety touch, which is very soft to the touch whilst also being of the highest quality. This material is often used on sports jerseys. 3) Flex. Flex is also reserved for textile printing. Unlike the flock, it is finer, and above all, it is smoother. 4) [Snap Pap]. Snap Pap is a very special paper, both solid and washable, that's made of cellulose (so like normal paper), and latex. It is an environmentally friendly vegan alternative to leather, much like cork. 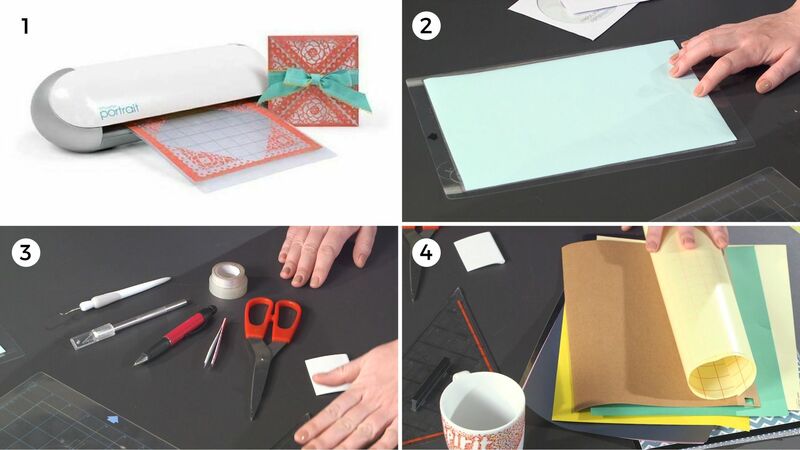 5) Paper is always a well-known option! 6) Another type of foil for textiles: fantasy flex, which we mention as a side category because even though it is a flex, it is a particular flex, much thicker than the basic flex, and therefore requires special settings on your SILHOUETTE cutter. This film is a fancy film with sequins, but there are also many other types of patterns and holograms that will be sure to delight your children! The first step is to choose the pattern you want to print. To do this, you can take your pick from our cutting files library. In this case we've chose a pattern of a unicorn. Launch your plotter software and open the chosen file. In the software you will be able to choose the settings such as the pressure of the cutting blade (the thicker the material, the higher the force on the rise), the size of the cut if you want to cut several patterns at once, etc. Once your preferences are chosen, press the "send to plotter" button and let the machine do the rest! Be careful to cut out your pattern in the mirror setting, especially if it's a text! Once the cut is complete, you are left with a film of flex (or other textile film) which has now been cut in the desired shape. It is now necessary to remove the parts that will not appear on the t-shirt. To do this, you can use a cutter or the crochet hook that our instructor is using in photo number 2. The more intricate the pattern, the more difficult and laborious this particular phase will be. Once the peeling phase has been completed, all you need to now do is iron your pattern onto the t-shirt! Adjust your iron to the warmest heat, have a Teflon sheet to protect the fabric and then iron on by stalling your iron over each part of the pattern for about fifteen seconds and pressing well. Carefully remove (making sure the print has stuck to the fabric) the transparent film, and... voilà ! 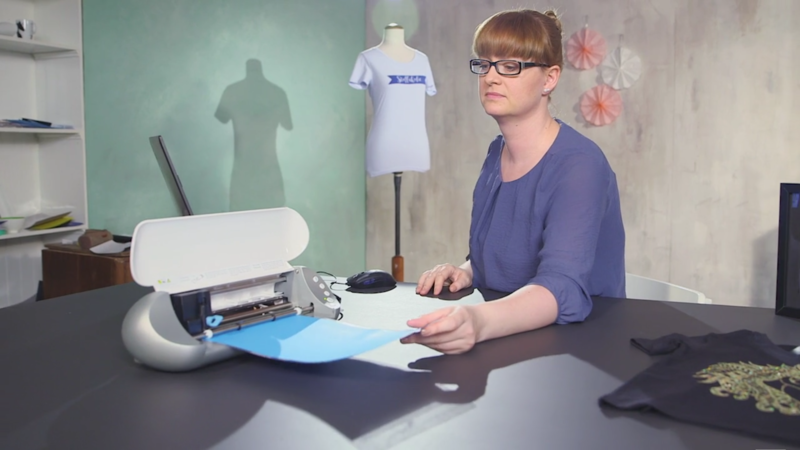 Using a plotter is really within everyone's reach. Do not be scared by the machine or the software: it is one of our best seller machines for the exact reason that it is very well made and its software is super easy to use. We have detailed a single print project on fabric, but the possibilities of the machine are endless. Trust yourself and let your creativity run wild!